Check this guide to see Nokia Lumia 2520 specs, including its best playback video format and native codec. Becides, you will get some useful tips for playing unsupported videos on Nokia Lumia 2520. With most market share gradually invaded by the hottest Apple and thriving Samsung, Nokia finally made a counter attack by releasing its first Windows tablet, Nokia Lumia 2520, hoping to turn the tide. It gives Microsoft’s own Surface line a run for its money with LTE connectivity, thin and light polycarbonate body, quad-core Snapdragon 800, 6.7 MP camera and great Full HD display with outdoor readability enhancements. Play videos with Nokia Lumia 2520 on the go! Nokia Music allows you to listen to songs you don’t own without an Internet connection, and you can work on the go on the Nokia tablet equipped with Microsoft Office (Words, Excel, and PowerPoint). How about playing videos? Yes, you can watch movies on Nokia Lumia 2520 on the move too! Only videos in the supported format list above can by played on Nokia Lumia 2520. If you want to transfer and play uncognized videos such as MKV, AVI, WMV, MP4, M2TS, VOB, etc on Nokia Lumia 2520, the first step you need to do is to convert all unsupported videos to compatible format for Nokia Lumia 2520 using the best Windows 8.1 Tablet Video Converter. Pavtube Video Converter Ultimate is a professional tool to help you quick convert various video formats including the MKV, AVI, WMV, MP4, M2TS, VOB format to Nokia 2520′s MP4 format with best video quality and simplest workflow. After converting, all the various videos existing on your computer can be transferred to Lumia 2520 to watch without consuming your bandwidth and worrying about the format compatibility. How to convert all kinds of video files to Nokia Lumia 2520 supported format? Install and launch it the best Windows 8.1 Video Converter. Click “Add Video” to load video source. The lumia 2520 converter converter supports video formats and codec like H.264, MPEG-4, MPEG-2, Xvid, TS, AVI, MP4, WMV, MKV, MOV, TOD, M2TS, MTS, MOD, VOB, TiVo and some other codecs. Step 2: Select output format for converting video to Nokia Lumia 2520. To convert all kinds of video for Nokia Lumia 2520, click the dropdown list of “Format” and set a Lumia 2520 supported format. 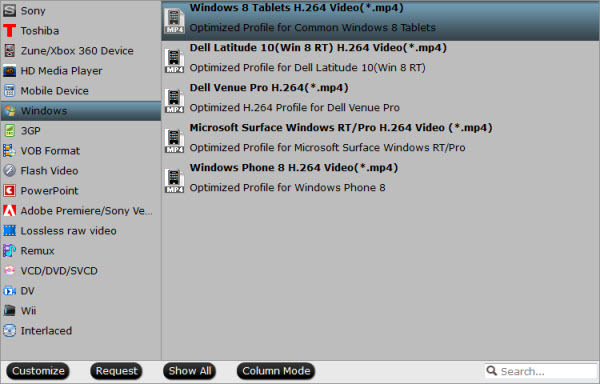 We recommend you to choose “Windows> Windows 8 Tablets H.264 Video(*.mp4)”. The output videos could fit on Nokia Lumia 2520 perfectly. Tips: You can click “Settings” to change the video encoder, resolution, frame rate, etc. as you wish. Keep in mind that bitrate higher results in big file size, and lower visible quality loss, and vice versa. For watching movies on Lumia 2520,720p with 1500~2000kbps is just all right. Step 3: Convert MKV, AVI, WMV, MP4, M2TS, VOB to Nokia Lumia 2520 supported format. Click “Convert” button to start convert MKV, VOB, AVI, Tivo, MPG, WMV, FLV/F4V videos to Lumia 2520. After conversion completes click the “Open” button to find the converted files. Now the converted videos can be put onto Nokia Lumia 2520 for entertainment. 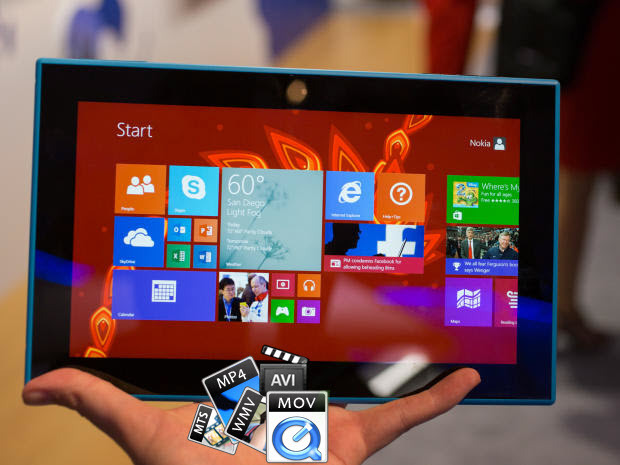 This is not only a Nokia Lumia 2520 video converter, but also a wonderful video editor. If you need converting MKV, AVI, WMV, MP4, M2TS, VOB, etc to iPhone, iPad, WP8, PS4, Android, Samsung Galaxy S4, Note 3, HTC and so on, please also do it with the same. Play DVD on Nokia Tablet – It is also possible to rip DVD to Nokia Lumia 2520 for playing.